In our relationship, Alison does the planning. She always has. I call myself the passive traveler, because I am quite happy to just go with the flow. There are few times when I have something I absolutely must do. With so much to see and do, why bother getting hung up on particular things? This exasperates Alison to no end and I am sure aggravates some of you dear readers as well. I am quite sure I’m not the only passive traveler out there. When Alison was leaving for Guyane, she asked me what I was going to do for a week, while she was gone. I had no idea. Even when I dropped her off at the train station, I had no concrete plan, just a vague idea of going to the Pyrenees to escape the heat and maybe sneak in a visit to the Airbus facility outside Toulouse. I had gone from passive traveler to seat of the pants traveler. She was gone and now I had to figure it out for myself. Crap! Luckily, I landed on my feet. In my last minute research, I found a small motorhome parking spot, or Aire, in the heart of the Pyrenees, south of Toulouse. It wasn’t listed in the main guides for camping-cars and the information I did have was only fragmentary: it was in Aulus-les-Bains, near the village centre, shaded, free, and in the mountains. Since there was limited information, I also figured it might be quieter than more popular locations. I packed up the cats and headed into the mountains. The drive to Aulus-les-Bains was a stunning highway that meandered through a sea of golden sunflowers and up across gorgeous mountain passes. The views were amazing any direction you looked. At the top of one of the passes, I stopped to watch some paragliders take off and then float down the valley. It was so peaceful on the top of the pass, I seriously thought about camping overnight right there! Aulus-les-Bains looks like a hill town. The Garbet River flows through the village, carrying cool mountain water. The buildings are made out of grey stone, and the village flows up the side of one hill. Baskets of red flowers hang on the side of the road and on the bridges, a perfect contrast against the greens, greys, and gold of the mountains. There is a butcher, a small grocery, a tabac, a few restaurants, and a tourist office all near the village centre – everything you need for a short stay. A spa town, Aulus-les-Bains became famous in the early to mid-19th century for helping people with ‘shameful illnesses’, mainly syphilis. Although the water didn’t really cure syphilis, the theory is the minerals in the water counteracted the effects of the mercury being used to treat syphilis, thereby providing some relief. The village quickly built multiple hotels, a casino, and various other resort features. 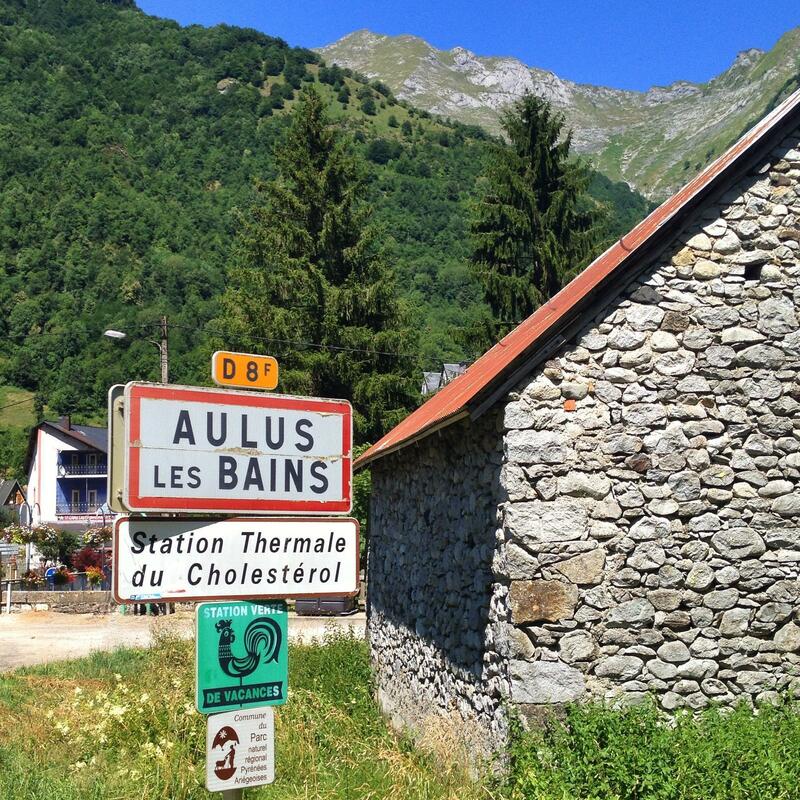 At its height, Aulus-les-Bains had nearly a thousand inhabitants and welcomed over 3000 visitors during the season. Today, the glory days have faded. 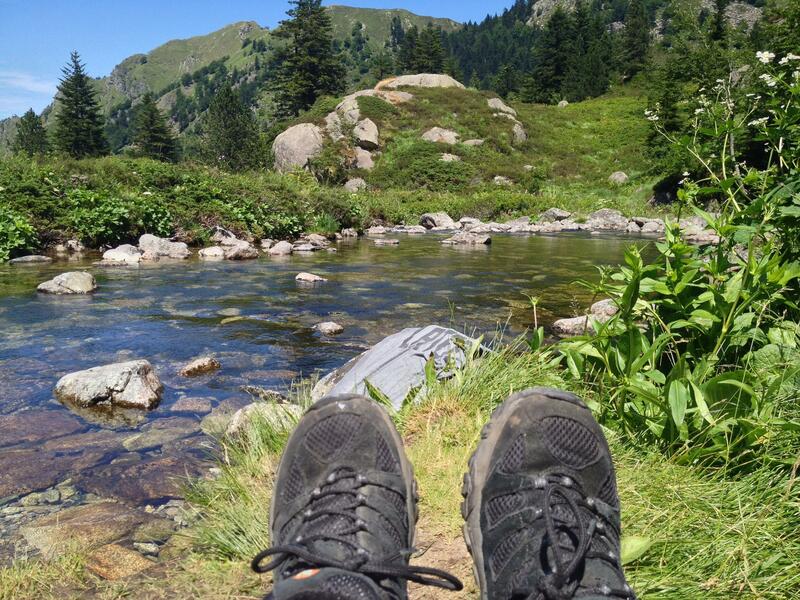 The population has dropped to around 230, and Aulus-les-Bains’ businesses now revolve around hiking and mountain sports. The spa still remains, focusing on treatments for cholesterol, urinary problems, and arthritis, but the grand hotels have all but disappeared. A couple of hotels look like they are being renovated, but the main lodging options in the village are gîtes (and gîtes d’étape, somewhat like a hostel for hikers), apartment rentals, and small hotels. Even with such a small population, the village feels alive, welcoming, and cosy. A big hotel might destroy that charm. 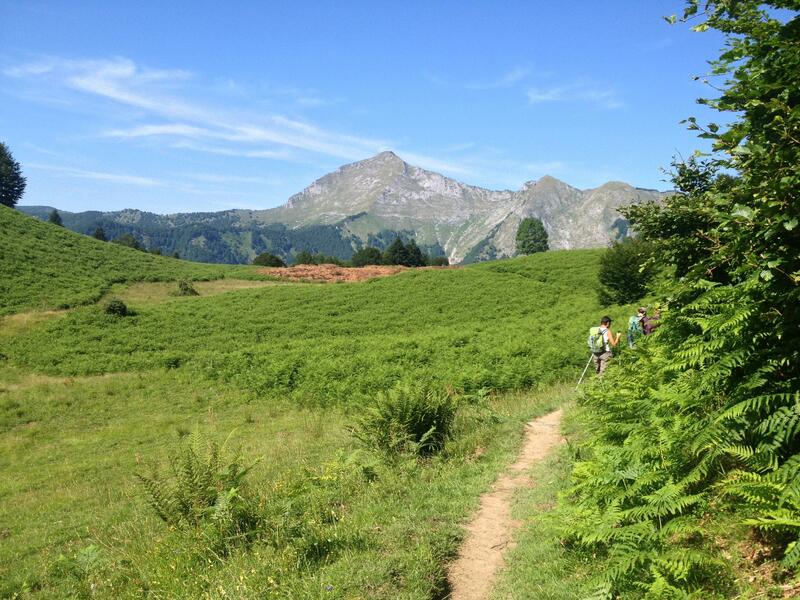 Although my main reason for visiting Aulus-les-Bains was to escape the heat, I was intrigued by the hiking. It is so prominent here, you get caught up in it. Everyone’s doing it, so why aren’t you? Always a sucker for peer pressure, I popped into the Tourist Office for information about the trails. 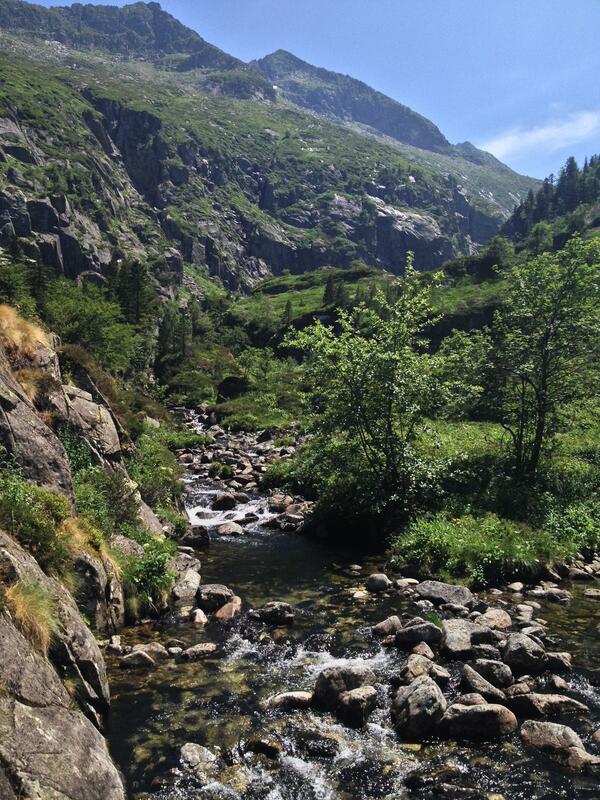 The mountains hold numerous routes and one of the most popular in the Pyrenees, the GR10 (aka the “Pyrenean Way”), roughly parallels the Spanish-French border and goes through Aulus-les-Bains. 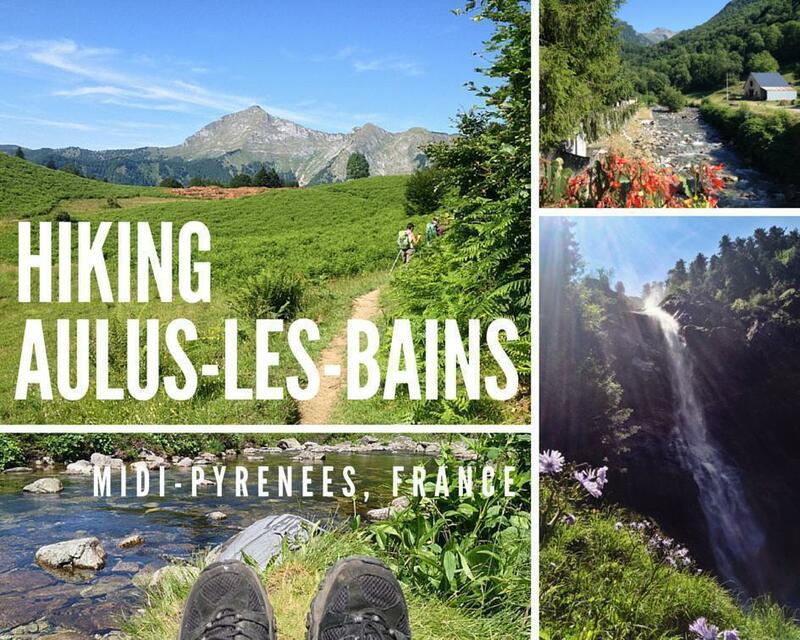 Popular day hikes from Aulus-les-Bains follow part of this route and take hikers up to the Ars River waterfall (3-4 hours) or to Guzet Pond (a small lake, 2-3 hours). I was also told it was possible to swim in Guzet Pond, which sounded very enticing on a hot day! Never one to go halfway, I opted to combine the hike to the Ars River waterfall with the Guzet Pond, by making a loop around the two, following the GR10 (5-6 hours total). I had no issue walking for 5-6 hours, so why not do both? Oh how naive I was. When the clouds cleared on Monday morning, I set off on my adventure. I started in the direction of the Ars River waterfall following a forest road. The road skirts the edge of Hell’s Pass, a narrow gorge carved by the Ars river, and has been rebuilt in several places due to the spring runoff. I was amazed to see whole mountain sides scraped bare of vegetation or huge trees in the middle of the road. After 45 minutes, the path leaves the road and the hike becomes more difficult. In general, the trail zigzags up the sides of the mountain, but in many places, the ‘path’ disappears into a pile of rocks you need to climb up and over. It was exhausting hiking up some of these steep slopes and scrambling over rocks. I was starting to think I might have misjudged when I decided to do the full loop! I was not alone on the trail though. There were many seasoned hikers on the trail, some with large backpacks and tents, but I was amazed by the number of families and seniors taking the same trail. Parents were climbing with a baby strapped on the back and kids in tow and even the grandparents walking alongside. There were plenty of walking sticks, but there were also people coming up with canes. The hike to the waterfall seems to be popular for young and old, and it put me to shame. If they could do it, I could do it. About two hours into my hike, I arrived at the waterfall. The hike was definitely worth the pain! The Ars River waterfall descends in three tiers, getting wider as it descends, then gushing down the hill in a torrent of white water. Even in early July, when all the snow is gone, the waterfall is still impressive. It must be thunderous in early spring! Many people brought their lunch and sat under the shade of the trees to eat and admire the waterfall. Some others climb further up where it is possible to get closer to the waterfall (safely) and enjoy a view out over the valley below. I kept climbing further (which took me through one of the most challenging parts of the trail) until I got to the Ars River Pass, a beautiful meadow above the waterfall, with the river gently flowing past. It is a perfect spot to spread out a picnic, soak in the river, and recover from the hike. All around are beautiful views of the mountains and the valleys. It was hard not to take a picture of absolutely everything. The walk to Guzet from the Ars River pass was the most challenging part of the hike. In a number of places, I had to cross avalanche fields or clamber over rocks with only the red and white symbols of the trail to guide me. At some points, I just laughed out loud because it was so absurd to think the trail actually went up a particular slope. But ahead of me, I could see other hikers clambering up the rocky slopes on the far side. In a few places you had to just hope the rocks below you didn’t start to roll. Once across the avalanche fields, the trail got easier and became a walking path again. From this point to Guzet Pond, the only risk was sliding on the loose gravel of the path while descending. Hot, sore, and sweaty, when I arrived at Guzet Pond I barely even stopped to take a picture. I simply stripped down to my shorts and dove in. The top 5cm of water was warm but beneath it was deliciously cool. Ahhhhhh! This was the perfect reward for 5 hours of hiking. Until my legs cramped. Oh boy did they cramp. Top tip: after walking for 5 hours, it probably isn’t a good idea to plunge hot muscles into cold water. I rested beside the pond, working the cramps out of my legs before getting dressed and heading back up onto the trail. 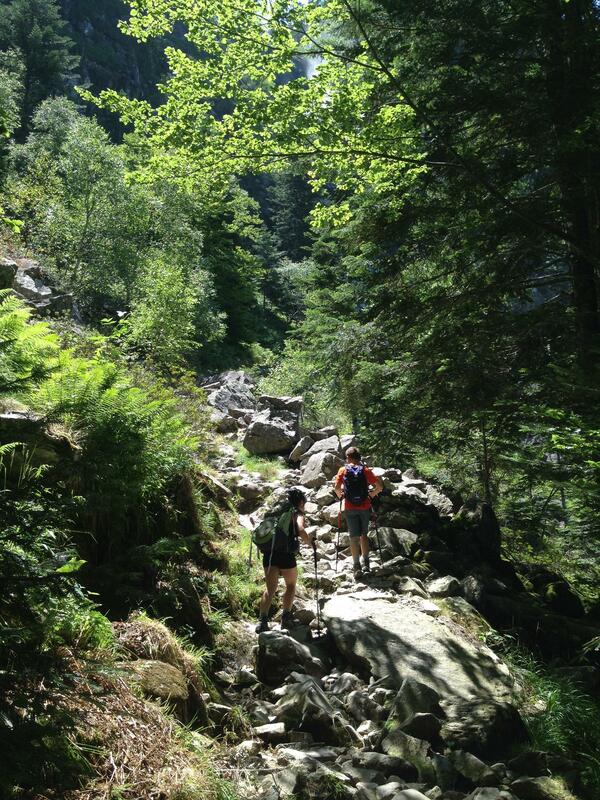 The final descent to Aulus-les-Bains was pretty uneventful, as the trail was well kept. 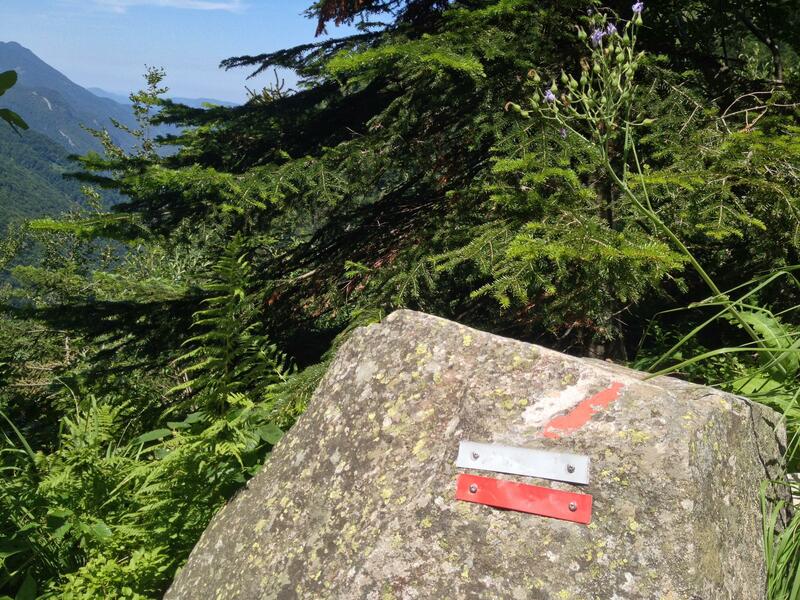 It turns out this part of the trail is used by a group of hill runners who train to run a vertical kilometre. I can’t imagine running down the mountain let alone up it! By the time I reached Aulus-les-Bains, the tops of my legs were jelly from controlling the speed of my descent. I actually had to walk for another 45 minutes on the flat village streets just to avoid my legs cramping again. In the end, I succeeded in completing the loop, but I learned a valuable lesson about underestimating the effort required to hike in the mountains. A 5-6 hour walk is nothing when the path is relatively flat. 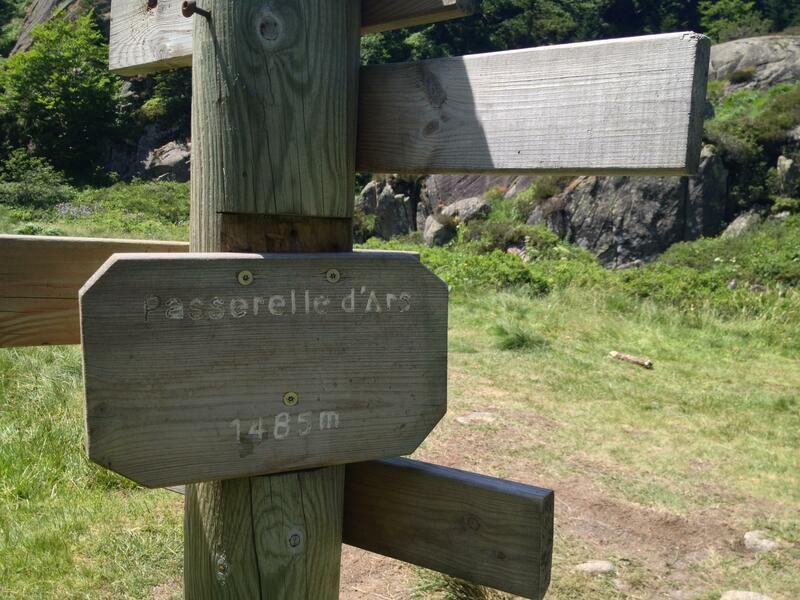 But when the trail also includes a 1200m ascent, clambering over and around rocks, it is a different story entirely. However, what a beautiful way to spend a day! I was exhausted but I got to see a part of the Pyrenees only seen by those who hike. The next afternoon I soaked my sore legs in the pool of the spa and reflected on my visit to Aulus-les-Bains. It is a perfect little village to use as a base for hiking and exploring the area. Everything you need is available within 100m and beyond is nature. Many villages I’ve passed through appear empty but Aulus-les-Bains feels alive. There is a hum and energy about the place, from the locals and from the people passing through. My favourite evening pastime was grabbing a couple of cold beer from the grocery and sitting in the village square. It was interesting just watching people come through the town, meet in the centre, and discuss their plans for the coming day. Getting to Aulus-les-Bains isn’t easy. Obviously you can walk (the preferred method for quite a few people I met), but I would recommend a car, so you can adventure further. Another option is a bus from St. Girons arriving several times a day during week days. Unfortunately, there is no train option in Aulus-les-Bains. However, limited access is what makes Aulus-les-Bains special. You have to WANT to be there, meaning you are there for the hiking and nature. 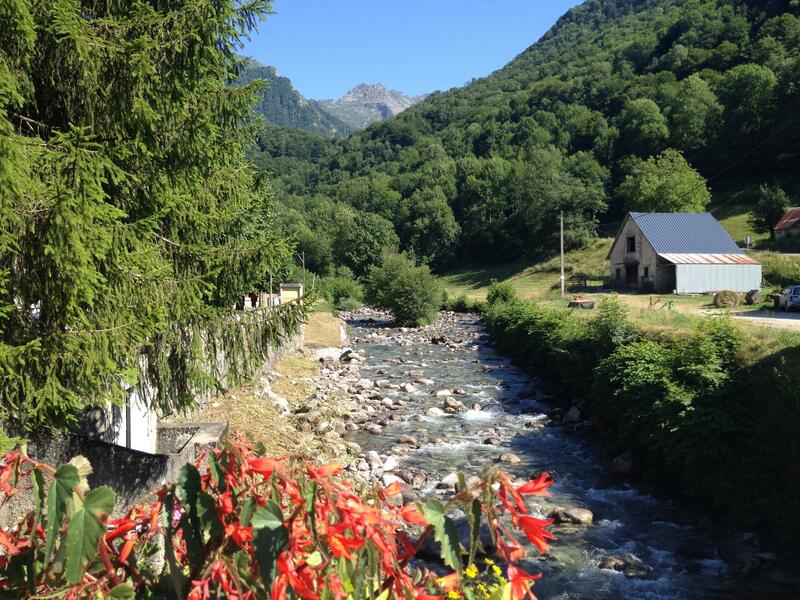 I loved my four days in Aulus-les-Bains and highly recommend it as a place to escape. A long weekend is enough time to hike, soak in the spa to recover from your hike, and experience the village. If you’re an experienced hiker, do the full loop. 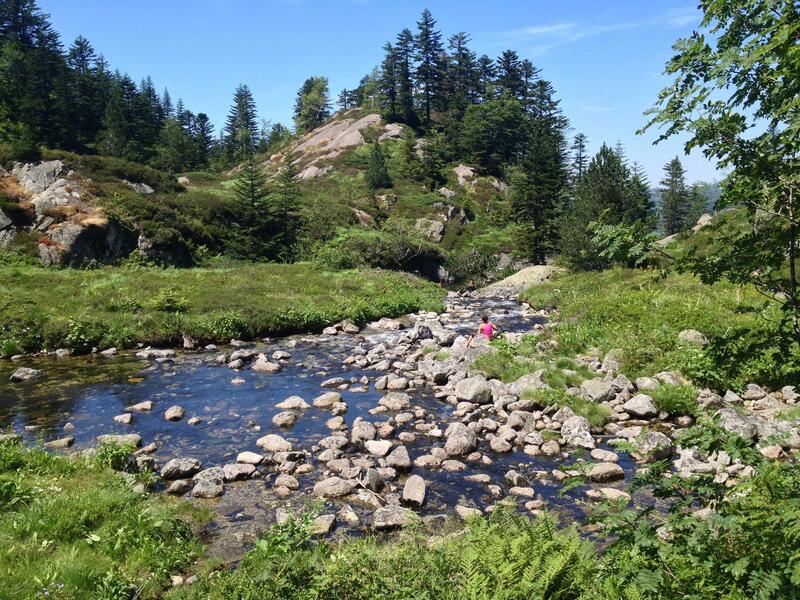 If you don’t want to climb up rocks, hike up to the Guzet Pond, as the trail is well maintained. 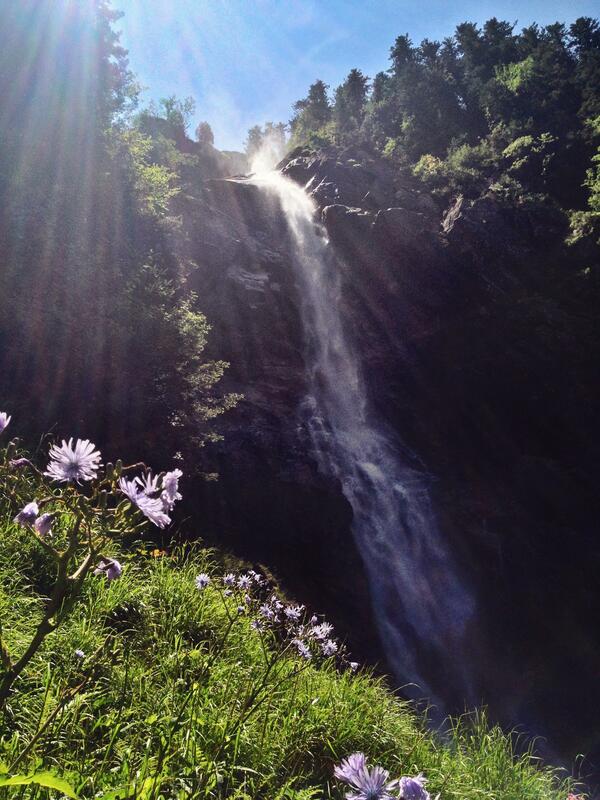 If you don’t mind a bit of a challenge, take the trail up to the Ars River waterfall. There is something for everyone and of every skill level. 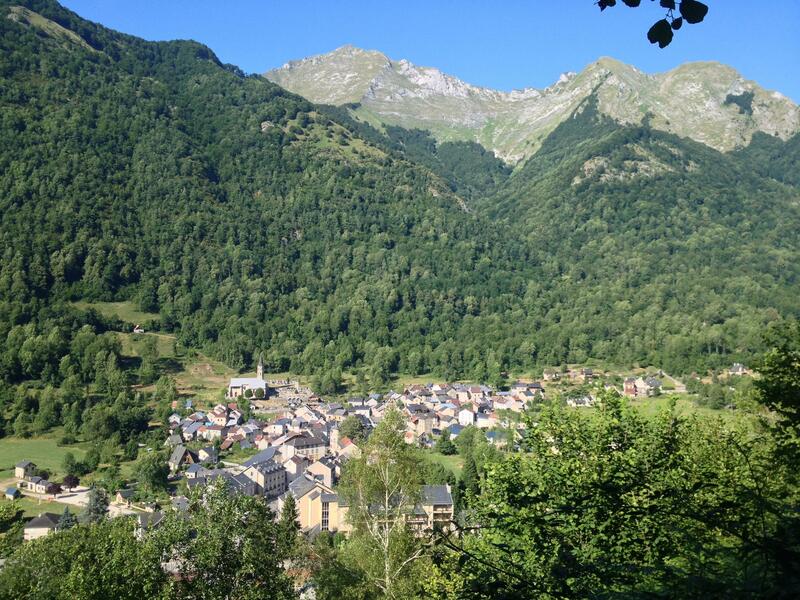 Have you visited any villages in the Pyrenees we should put on our list? Share your thoughts in the comments below.